Welcome the colliedog.net - home of the Northumberland sheepdog trials. The Northumberland League Sheepdog Trials Society was inaugerated on 22 June 1976 in the Queens Hotel, Alnwick. A group of shepherds , Jim Easton, Bob Fraser, John Dixon (Digger), Jack Tulley, Ron Bailey, Bill Graham, Gordon Rogerson and Jimmy Dickinson, met with Local Businessman, John Metcalf, with the intention of promoting the craft of sheepdog trialing in the County. The League is still flourishing today with approximately 30 Open trials and 10 Nursery Trials affiliated with it. Membership of the League is open to anyone living in Northumberland. Open Trials are held in the summer months and attract entries from trialists near and far. Members of the League obtain points when they get in the prize list. At the end of the season the man and dog with most points wins the Northumberland League Championship. The John Metcalf Trophy is presented to the highest pointed open dog in the League. Cups are also awarded for the highest pointed League dog in the English National Trials, winner of the Young Handlers Trial, winner of the Nursery League and others. The Nursery Trials are open to dogs not having been placed in an Open Trial and under 3 years of age on the 31st of December in that season. Prizes are given out every year at the League Sheepdog Dinner and Dance in November. The dogs don't usually attend but the handlers and their partners have a good celebration. If you would like to attend, please contact us for details. The Northumberland Sheepdog Trials League is keen to promote participation by new handlers and runs a series of new handler sessions throughout the summer together with a Judging Seminar. You'll find details of dates and venues on the Forthcoming Events section of the Website. 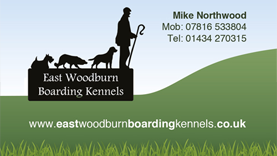 Northumberland League Sheepdog Trials Society is affiliated to The International Sheepdog Society.